Introduction: Telmisartan is one of the preferred choices of antihypertensive in patients of diabetes with hypertension (HTN) and lowers blood pressure (BP) effectively. Objective: The objective of the study was to determine BP-lowering efficacy of telmisartan monotherapy in patients of Stage I HTN with or without complications of type 2 diabetes mellitus (T2DM). Materials and Methods: In this retrospective study, patients of T2DM without (Group A) or with (Group B) complications who had Stage I HTN and were prescribed telmisartan (20–80 mg/day) treatment were identified from database. Patients included were adults 18 years and above with BP ≥140/80 mmHg but <160/100 mmHg. 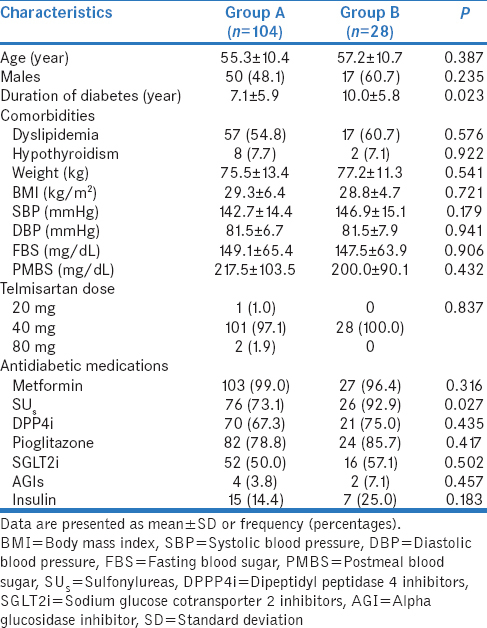 Data related to demographics, systolic and diastolic BP, blood glucose parameters, and weight before initiation of telmisartan and at the end of 12 weeks treatment were compared with appropriate statistics. Results: In 132 patients included, 28 (21.2%) patients had one or more complications of T2DM. Mean age in Group A and B was similar whereas mean duration of diabetes was significantly higher in Group B than Group A (10.0 ± 5.8 vs. 7.1 ± 5.9, P = 0.023). Telmisartan 40 mg was most frequently used strength (97.1% and 100.0% patients in two groups). Change from baseline in systolic BP in Groups A and B was −19.5 mmHg (95% confidence interval [CI] −16.3, −22.7; P < 0.0001) and −24.9 mmHg (95% CI −17.3, −32.5; P < 0.0001), respectively. Reduction in diastolic BP was also significant in two groups. There were no significant differences in adjusted means of systolic and diastolic BP in two groups. 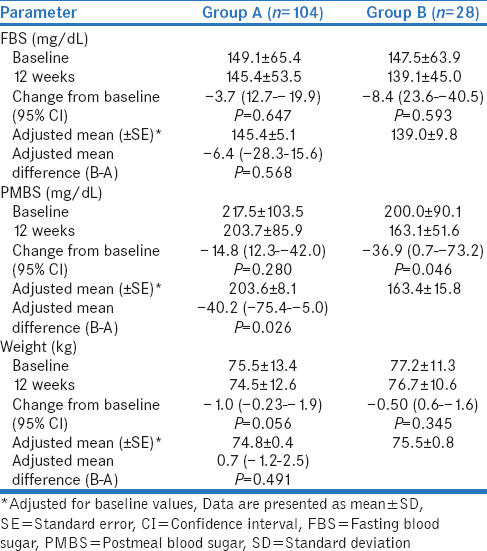 In Group A and B, change from baseline in fasting glucose was −3.7 mg/dL (P = 0.647) and −8.4 mg/dL (P = 0.593); in postmeal glucose was −14.8 mg/dL (P = 0.280) and −36.9 mg/dL (P = 0.046), respectively. Conclusion: Telmisartan is effective in lowering BP and improving metabolic parameters in patients of T2DM with or without complications. A larger and long duration study is needed to substantiate our findings. Type 2 diabetes mellitus (T2DM) is steadily growing epidemic worldwide and has risen exponentially in India over the past few decades. Currently, there are 69.2 million patients with diabetes in India. Associated complications significantly impact the quality of life (QoL) in patients with T2DM. Economic burden of T2DM may hinder patients' access to the treatment in countries like India. Low socioeconomic status is found to be one of the barriers in control of glycemia. Effective control of glycemia is essential to prevent the development of complications including endothelial dysfunction (ED). Hyperglycemia-induced ED leads to vascular remodeling. Alterations in extracellular matrix, altered functioning of endothelial cells, and vascular smooth muscle cells lead to arterial stiffness, loss of elastic recoil, and decreased vasodilating capacity., This way arterial stiffness not only contributes to the end-organ damage and probably increases the risk of cardiovascular (CV) events. Hypertension (HTN) and diabetes together contribute to arterial stiffness that leads to poor control of blood pressure (BP). HTN control in T2DM is essential to prevent the progression and development of microvascular and macrovascular complications. Telmisartan is an easily metabolized sartan useful, especially in patients of T2DM with HTN. Telmisartan has been found to reduce ED and is effective in retarding the progression of diabetic nephropathy.,,, Furthermore, in the ONTARGET study, telmisartan was reported as equally effective to ramipril in lowering the CV events. Telmisartan not only lowers BP and CV events but also it exerts metabolic effects and lowers arterial stiffness which are beneficial to patients with T2DM. Although telmisartan is one most frequently prescribed antihypertensive agents in India, there is a relative lack of studies exploring its antihypertensive effect in Indian patients with diabetes. Hence, we aimed to evaluate the antihypertensive effect of telmisartan in patients of T2DM with or without complications. This study was a retrospective evaluation of patients with T2D from electronic database at an urban diabetes care and research center in Mumbai, India. Our center caters to the urban, semi-urban, and urban-slum population in Mumbai and suburbs. Database was screened to include adult patients aged ≥18 years with T2D and newly diagnosed HTN (defined as systolic BP ≥140 or diastolic BP ≥80 mmHg but <160/100 mmHg) who were prescribed telmisartan monotherapy (20–80 mg/day) for the control of BP. Any patient with BP >160/100 mmHg, type 1 diabetes, pregnant and lactating females, patients with known chronic medical disorder necessitating frequent hospital admissions, and patients receiving any form of renal replacement therapy were excluded from the study. From the database, patients' data were segregated as per inclusion and exclusion criteria. Patients with complications of diabetes were identified. Patients were divided into two groups based on presence of any diabetes associated micro- or macro-vascular complications as Group A - without complications and Group B - with complication/s. Newly diagnosed HTN patients were followed regularly to monitor BP control as per our hospital protocol. We identified patients whose BP was recorded at baseline (before the start of treatment), 2 weeks, 4 weeks, 8 weeks, and at 12 weeks of treatment and analyzed their demographic and clinical data. Clinical data on age, gender, duration of diabetes, and presence of comorbidities were extracted. Available BP levels, fasting and postprandial levels, and weight were analyzed. Patients on antidiabetic medications including oral hypoglycemic agents and insulin were identified. As defined in Joint National Committee-8 recommendations, patients who had BP <140/80 mmHg were identified and labeled as controlled BP and their distribution in subsequent follow-ups was assessed. The primary objective of the study was to assess effect of telmisartan monotherapy on BP in T2D patients with and without complications. Secondary objective was to assess the effect of telmisartan treatment on blood sugar and weight parameters. Analysis was performed after approval of study protocol by local Institutional Ethical Committee and was conducted as per principles of Declaration of Helsinki. For this study, there was no formal sample size calculation. As the study is retrospective analysis of data, patients encountered in specified time duration of 6 months were considered for analysis. From database, we observed 132 patients eligible for inclusion into the study and were analyzed. Data were entered in Microsoft Spreadsheet version 2016. Continuous variables were presented as mean and standard deviations (SDs) and categorical variables as frequency and percentages. Student's t-test was applied for comparison of two related continuous variables. Chi-square test or Fischer's exact test was used for the comparison of categorical data. Change in continuous variables from baseline to week 12 was reported as mean change with 95% confidence intervals (CIs). Analysis of covariance was performed to assess the differences in two groups considering the baseline values as covariates. Differences in adjusted means were determined. P < 0.05 was considered statistically significant. From the database, 132 patients meeting inclusion and exclusion criteria were analyzed. Among these, 78.8% (n = 104) had no diabetes-related complications whereas 21.2% (n = 28) had one or more complications [Figure 1]. Most frequent complication observed was peripheral neuropathy (n = 21, 15.9%), followed by nephropathy (n = 6, 4.5%), retinopathy (n = 2, 1.5%), ischemic heart disease (n = 1, 0.8%), and cerebrovascular complication (n = 1, 0.8%). [Table 1] summarizes baseline demographic and clinical characteristics of patients without (Group A) or with (Group B) complications of T2D. Mean (±SD) age was 55.3 ± 10.4 and 57.2 ± 10.7 years in two groups, respectively (P = 0.387). Proportion of males was nonsignificantly greater in Group B than Group A (60.7% vs. 48.1%, respectively, P = 0.235). Mean duration of diabetes was significantly higher in Group B than Group A (10.0 ± 5.8 vs. 7.1 ± 5.9 years, respectively, P = 0.023). Dyslipidemia was common in patients from both groups with no significant difference in proportion of patients (P = 0.576). Among clinical parameters in two groups, weight (P = 0.541), body mass index (BMI) (P = 0.721), systolic BP (P = 0.179), diastolic BP (P = 0.941), fasting blood sugar (FBS) (P = 0.906), and PMBS (P = 0.432) were comparable. Telmisartan 40 mg strength was most frequently used with 97.1% and 100% patients from Group A and B (P = 0.837). Among antidiabetic medication, distribution of patients receiving any medication did not differ significantly in either groups except for sulfonylureas which were prescribed more frequently in patients from Group B than Group A (92.9% vs. 73.1%, respectively, P = 0.027). 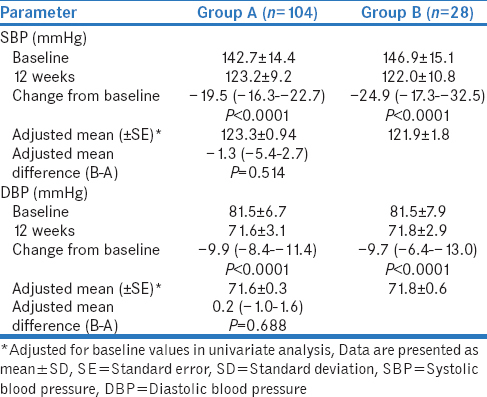 In both groups, mean reduction in systolic and diastolic BP was significant [Table 2]. Change from baseline to week 12 in systolic BP was −19.5 mmHg (95% CI: −16.3, −22.7; P < 0.0001) in Group A and −24.9 mmHg (95% CI: −17.3, −32.5; P < 0.0001) in Group B. Similarly, diastolic BP change in Group A was −9.9 mmHg (95% CI: −8.4, −11.4; P < 0.0001) and in Group B was −9.7 mmHg (95% CI: −6.4, −13.0; P < 0.0001). The adjusted mean difference in systolic and diastolic BP in two groups was −1.3 mmHg (95% CI: −5.4, 2.7, P = 0.514) and 0.2 mmHg (95% CI: −1.0, 1.6, P = 0.688) with no statistical significance achieved. Trend in a change of systolic and diastolic BP over 12 weeks is shown in [Figure 2]. 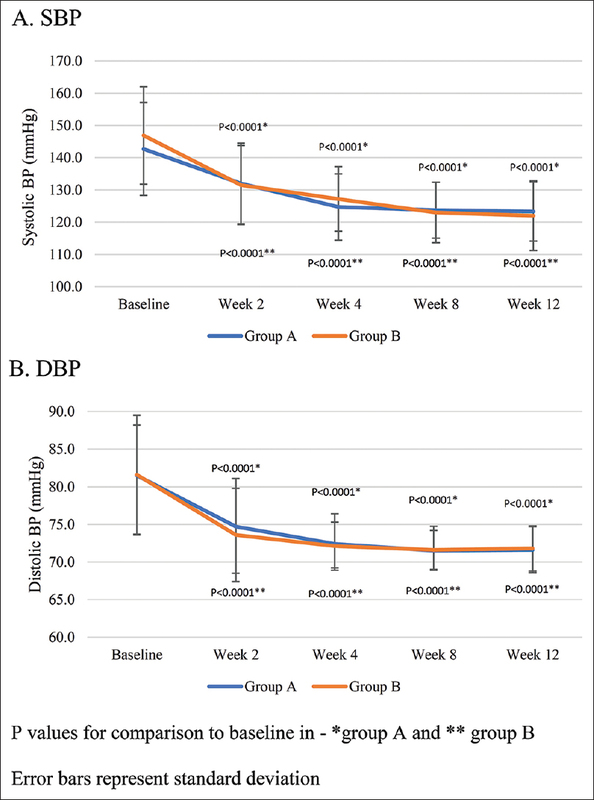 In both groups, a significant reduction of systolic and diastolic BP from baseline was evident in 2 weeks and continued till week 12 (P < 0.0001 compared to baseline for SBP and DBP at each week). At 12 weeks, the proportion of patients who achieved BP target systolic BP <140 mmHg and diastolic BP <80 mmHg was 91.3% and 93.3%, respectively, in Group A and 92.9% and 92.9%, respectively, in Group B. The proportion of patients achieving target BP of <140/80 mmHg gradually increased from week 2 to week 12 as seen in [Figure 3]. Changes in blood sugar levels and weight are described in [Table 3]. In both Group A and B, there was statistically nonsignificant reduction in FBS (−3.7 mg/dL, P = 0.647 and −8.4 mg/dL, P = 0.593, respectively) and the adjusted mean difference was −6.4 mg/dL (95% CI: −28.3, 15.6) which was nonsignificant (P = 0.568). Reduction in postmeal blood sugar was nonsignificant in Group A (−14.8 mg/dL, 95% CI: 12.3, −42.0; P = 0.280) but reached significance level in Group B (−36.9 mg/dL, 95% CI: 0.7, −73.2; P = 0.046). This was associated with significant difference in adjusted means of PMBS in two groups (−40.2 mg/dL, 95% CI: −75.4, −5.0; P = 0.026). 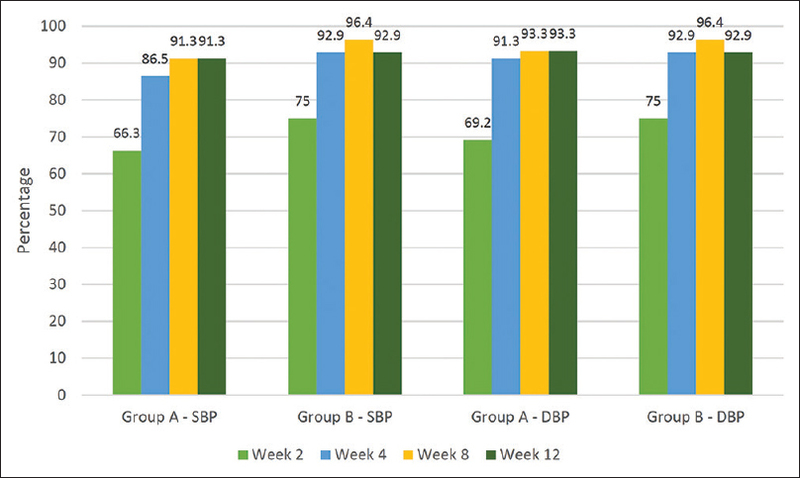 Change in weight from baseline to week 12 was −1.0 kg in Group A and −05 kg in Group B with near significance achieved in Group A (P = 0.056) but not in Group B (P = 0.345). In patients with T2DM, rate of complications was 21.2% suggesting one of five diabetic patients may develop one or more complications. Duration of diabetes was significantly longer in patients with complications. It is well known that duration of diabetes affects occurrence of complications and is linearly associated with both macro- and micro-vascular complications. HTN is the most frequent accompanied comorbidity in T2DM, and it has a significant impact of development and progression of complications. Among various antihypertensive agents, antagonists at renin–angiotensin–aldosterone system are recommended as first-line agents by recent JNC-8 recommendations. Being a agonist at peroxisome proliferator-activated receptor γ (PPAR-γ), telmisartan can be considered as the first choice of treatment in diabetic patients with HTN. In this analysis, we observed that with comparable baseline characteristics, telmisartan 20–80 mg/day was effective in reducing BP significantly in patients with or without complications of diabetes. As hyperglycemia induces subtle changes in vascular cells including increased contractility, increased synthesis of extracellular matrix proteins with hyperplasia, and hypertrophy of cells, these changes are complex and are expected to be worse in patients with complications of diabetes. This is associated with altered vascular responsiveness and may be associated with poor control of BP. Telmisartan was effective in reducing BP in both groups of patients. Telmisartan is one of the most efficacious antihypertensives. A meta-analysis established greater antihypertensive effect than ramipril, enalapril, and perindopril. One of the major mechanisms responsible for organ protection offered with telmisartan is improvement or reversal of ED. Telmisartan prevents upregulation of cell surface receptor for advanced glycation end-products. In TRENDY trial, telmisartan 40 mg was similar in efficacy to ramipril 10 mg in improving ED in diabetic patients with HTN. This combined with improvement in arterial stiffness contributes to favorable effects of telmisartan., Telmisartan provides end-organ protection beyond BP control as observed in renoprotection offered in VIVALDI trial. We observed a gradual reduction in mean BP over 12 weeks with a significant reduction being achieved as early as 2 weeks from baseline. This suggests a rapid lowering of BP in patients with T2D with similar efficacy in both groups. At the end of 12 weeks, over 90% patients achieved target BP <140/80 mmHg. A rapid reduction of BP with higher magnitude is beneficial in terms or reducing major CV complications as observed in VALUE trial. Findings from HOT trial in a subgroup of patients with diabetes also confirm that significant reduction of CV events is achieved with target of diastolic BP ≤80 mmHg. Achieving the desired goal necessitates early initiation of antihypertensive therapy, especially in patients with diabetes because their efficacy in terms of CV events reduction may be lower when target organ damage is already existent. Besides being a potent antihypertensive, PPAR-γ agonist activity of telmisartan imparts beneficial effects in terms of metabolic changes. We observed a reduction in blood sugar (nonsignificant for fasting blood glucose in both groups whereas significant for postmeal blood glucose in Group B). Due to changes in glucose and lipid parameters associated with telmisartan, it is said to be a metabolic sartan. A meta-analysis of randomized controlled trials significant reduction in levels of FBS, insulin, and HbA1c and increase in homeostatic model assessment index in patients with metabolic syndrome. A study by Sasaki et al. showed more beneficial effects of telmisartan compared olmesartan in glucose and lipid profiles. In patients with diabetes, Mori et al. demonstrated benefits of telmisartan in increasing high molecular weight adiponectin levels and improving insulin resistance. Thus, by activating PPAR-γ, improving insulin resistance, and inhibiting RAAS, telmisartan is the therapy of choice for HTN in patients with diabetes. Of note, a significant reduction in PMBS observed in our study might be because of intensive glucose lowering therapy implemented in patients with complications of diabetes. This is supported by fact of sulfonylureas were prescribed in significantly greater proportion of patients with complications. Nonsignificant reduction in weight was probably the part of the continued treatment of diabetes as telmisartan does not affect weight significantly. In a study of metabolic effects of telmisartan in obese patients, compared to placebo, telmisartan was not associated with significant change in BMI or any other anthropometric features. However, there was a significant improvement in beta cell function determined by insulinogenic index. Telmisartan was found to be equally effective in reducing BP in patients with complications of diabetes who are more likely to have advanced vascular disease with heightened pressure response when compared to those without any complications. This suggests early and monitored use of telmisartan might prove extremely beneficial to patients of diabetes with HTN. Our study is exclusive in that we have distinguished the BP response in patients of diabetes with complications against without complications. We did not find any study in literature with such focused population. Although telmisartan is being used in India for long, there is relative lack of the studies in Indian diabetic population, in which case this study becomes important in ascertaining the effectiveness of telmisartan in Indians with diabetes. The study also brings forward epidemiological estimates related to diabetic complications. Factors that limited our study include design factors namely retrospective design, small sample, and short follow-up. We did not assess effects on lipid parameters. Although lifestyle interventions are prescribed to all the diabetic patients, their contribution to BP lowering was not assessed. Assessing ambulatory BP might provide greater insights into BP lowering ability of telmisartan in patients with diabetes. Telmisartan was associated with significant reduction in systolic as well as diastolic BP over 12-week treatment, and significant BP lowering was found with first 2 weeks. A beneficial effect on blood glucose and weight probably contributes to the improvement in vascular health. Near-equivalent BP reduction in patients with or without complications of diabetes suggests that telmisartan is the choice of therapy in these patients. Given the phenotype of Indian diabetics, telmisartan seems a choice of agents for HTN management in patients with or without the complication of diabetes. IDF Diabetes Atlas. 7th ed. 2015. International Diabetes Federation. Available from: https://www.idf.org/e-library/epidemiology-research/diabetes-atlas/13-diabetes-atlas-seventh-edition.html. [Last accessed on 2017 May 12]. Lloyd A, Sawyer W, Hopkinson P. Impact of long-term complications on quality of life in patients with type 2 diabetes not using insulin. Value Health 2001;4:392-400. Houle J, Lauzier-Jobin F, Beaulieu MD, Meunier S, Coulombe S, Côté J, et al. Socioeconomic status and glycemic control in adult patients with type 2 diabetes: A mediation analysis. BMJ Open Diabetes Res Care 2016;4:e000184. Spinetti G, Kraenkel N, Emanueli C, Madeddu P. Diabetes and vessel wall remodelling: From mechanistic insights to regenerative therapies. Cardiovasc Res 2008;78:265-73. Sena CM, Pereira AM, Seiça R. Endothelial dysfunction - A major mediator of diabetic vascular disease. Biochim Biophys Acta 2013;1832:2216-31. Lim HS, Lip GY. Arterial stiffness in diabetes and hypertension. J Hum Hypertens 2004;18:467-8. Pickering TG. Arterial stiffness as a cause of resistant hypertension? J Clin Hypertens (Greenwich) 2007;9:390-5. Parati G, Bilo G, Ochoa JE. Benefits of tight blood pressure control in diabetic patients with hypertension: Importance of early and sustained implementation of effective treatment strategies. Diabetes Care 2011;34 Suppl 2:S297-303. Takagi H, Niwa M, Mizuno Y, Goto SN, Umemoto T, ALICE (All-Literature Investigation of Cardiovascular Evidence) Group, et al. Telmisartan as a metabolic sartan: The first meta-analysis of randomized controlled trials in metabolic syndrome. J Am Soc Hypertens 2013;7:229-35. Bakris G, Burgess E, Weir M, Davidai G, Koval S, AMADEO Study Investigators, et al. Telmisartan is more effective than losartan in reducing proteinuria in patients with diabetic nephropathy. Kidney Int 2008;74:364-9. Barnett A. Preventing renal complications in type 2 diabetes: Results of the diabetics exposed to telmisartan and enalapril trial. J Am Soc Nephrol 2006;17:S132-5. Schmieder RE, Delles C, Mimran A, Fauvel JP, Ruilope LM. Impact of telmisartan versus ramipril on renal endothelial function in patients with hypertension and type 2 diabetes. Diabetes Care 2007;30:1351-6. Galle J, Schwedhelm E, Pinnetti S, Böger RH, Wanner C, VIVALDI investigators. Et al. Antiproteinuric effects of angiotensin receptor blockers: Telmisartan versus valsartan in hypertensive patients with type 2 diabetes mellitus and overt nephropathy. Nephrol Dial Transplant 2008;23:3174-83. Ontarget Investigators, Yusuf S, Teo KK, Pogue J, Dyal L, Copland I, et al. Telmisartan, ramipril, or both in patients at high risk for vascular events. N Engl J Med 2008;358:1547-59. Asmar R, Gosse P, Topouchian J, N'tela G, Dudley A, Shepherd GL, et al. Effects of telmisartan on arterial stiffness in type 2 diabetes patients with essential hypertension. J Renin Angiotensin Aldosterone Syst 2002;3:176-80. Tandon VR, Sharma S, Mahajan S, Mahajan A, Khajuria V, Mahajan V, et al. Antihypertensive drug prescription patterns, rationality, and adherence to joint national committee-7 hypertension treatment guidelines among Indian postmenopausal women. J Midlife Health 2014;5:78-83. Zoungas S, Woodward M, Li Q, Cooper ME, Hamet P, Harrap S, et al. Impact of age, age at diagnosis and duration of diabetes on the risk of macrovascular and microvascular complications and death in type 2 diabetes. Diabetologia 2014;57:2465-74. Long AN, Dagogo-Jack S. Comorbidities of diabetes and hypertension: Mechanisms and approach to target organ protection. J Clin Hypertens (Greenwich) 2011;13:244-51. Galzerano D, Capogrosso C, Di Michele S, Galzerano A, Paparello P, Lama D, et al. New standards in hypertension and cardiovascular risk management: Focus on telmisartan. Vasc Health Risk Manag 2010;6:113-33. Feener EP, King GL. Vascular dysfunction in diabetes mellitus. Lancet 1997;350 Suppl 1:SI9-13. Zou Z, Xi GL, Yuan HB, Zhu QF, Shi XY. Telmisartan versus angiotension-converting enzyme inhibitors in the treatment of hypertension: A meta-analysis of randomized controlled trials. J Hum Hypertens 2009;23:339-49. Kinouchi K, Ichihara A, Sakoda M, Kurauchi-Mito A, Murohashi-Bokuda K, Itoh H, et al. Effects of telmisartan on arterial stiffness assessed by the cardio-ankle vascular index in hypertensive patients. Kidney Blood Press Res 2010;33:304-12. Julius S, Kjeldsen SE, Weber M, Brunner HR, Ekman S, Hansson L, et al. Outcomes in hypertensive patients at high cardiovascular risk treated with regimens based on valsartan or amlodipine: The VALUE randomised trial. Lancet 2004;363:2022-31. Hansson L, Zanchetti A, Carruthers SG, Dahlöf B, Elmfeldt D, Julius S, et al. Effects of intensive blood-pressure lowering and low-dose aspirin in patients with hypertension: Principal results of the hypertension optimal treatment (HOT) randomised trial. HOT study group. Lancet 1998;351:1755-62. Sasaki T, Noda Y, Yasuoka Y, Irino H, Abe H, Adachi H, et al. Comparison of the effects of telmisartan and olmesartan on home blood pressure, glucose, and lipid profiles in patients with hypertension, chronic heart failure, and metabolic syndrome. Hypertens Res 2008;31:921-9. Mori H, Okada Y, Arao T, Nishida K, Tanaka Y. Telmisartan at 80 mg/day increases high-molecular-weight adiponectin levels and improves insulin resistance in diabetic patients. Adv Ther 2012;29:635-44. Chetty VT, Damjanovic S, Gerstein H, Singh N, Yusuf S, Anand SS, et al. Metabolic effects of telmisartan in subjects with abdominal obesity: A prospective randomized controlled trial. Blood Press 2014;23:54-60.